I was wondering if there is a way to set an external display positioned towards visible right of my Mac as primary, and always show the app switcher UI Command + Tab on that display. I tried the said arrangement (as shown below), but the app switcher still appears on the MacBook Pro's built-in display (on left), which is very annoying, as I have to turn my head left to see which app is selected. As you can see, I positioned the white bar (that should define the main display) in the external display - however, this behaviour is not respected. How do I configure my system to achieve the intended behaviour. I am using a MacBook Pro running macOS Sierra 10.12.6. 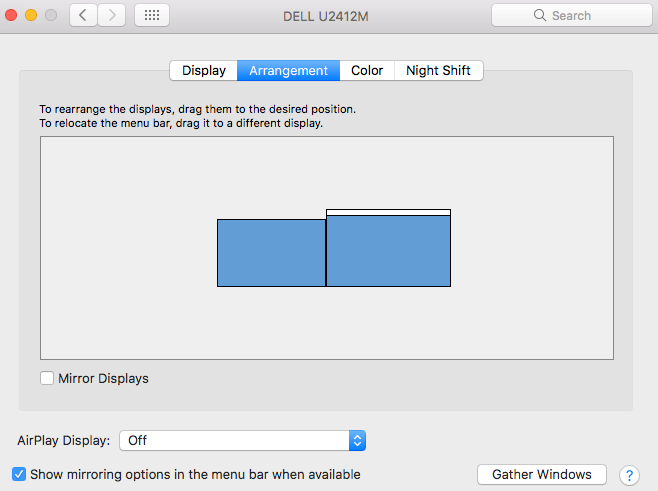 The primary display is configured correctly. The app switcher should be shown on the external display, only if the Dock is not set to Automatically hide and show, and is always visible on screen. Make sure you have not enabled Automatically hide and show the Dock under System Preferences → Dock. If enable, toggle the setting by unchecking and re-checking it. If you wish to keep the Dock hidden and shown only when the mouse pointer touches the edge which houses the Dock, the app switcher will be shown on the screen that has last displayed the Dock. Thus, to show the app on your main display (external, on visible right), move the mouse pointer to the edge of the Dock, momentarily display it and then use the app switcher with the keyboard shortcut Command + Tab. Not the answer you're looking for? Browse other questions tagged display sierra system-prefs preferences .